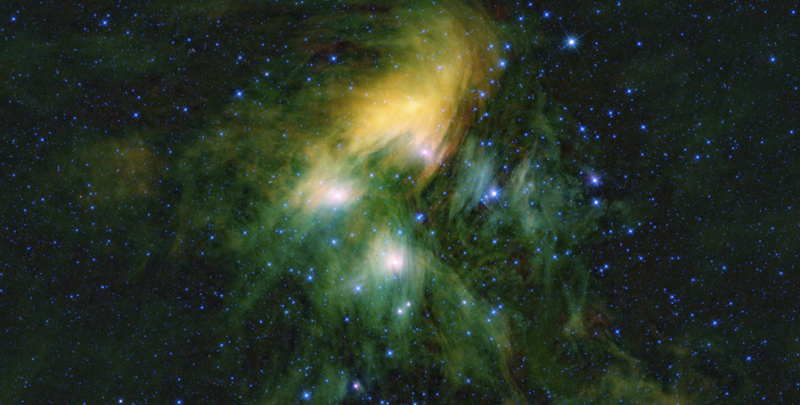 Like cosmic ballet dancers, the stars of the Pleiades cluster are spinning. But these celestial dancers are all twirling at different speeds. Astronomers have long wondered what determines the rotation rates of these stars. By watching these stellar dancers, NASA's Kepler space telescope during its K2 mission has helped amass the most complete catalog of rotation periods for stars in a cluster. This information can help astronomers gain insight into where and how planets form around these stars, and how such stars evolve. "We hope that by comparing our results to other star clusters, we will learn more about the relationship between a star’s mass, its age, and even the history of its solar system," said Luisa Rebull, a research scientist at the Infrared Processing and Analysis Center at Caltech in Pasadena, California. She is the lead author of two new papers and a co-author on a third paper about these findings, all being published in the Astronomical Journal. The Pleiades star cluster is one of the closest and most easily seen star clusters, residing just 445 light-years away from Earth, on average. At about 125 million years old, these stars -- known individually as Pleiads -- have reached stellar "young adulthood." In this stage of their lives, the stars are likely spinning the fastest they ever will. As a typical star moves further along into adulthood, it loses some zip due to the copious emission of charged particles known as a stellar wind (in our solar system, we call this the solar wind). The charged particles are carried along the star’s magnetic fields, which overall exerts a braking effect on the rotation rate of the star. Rebull and colleagues sought to delve deeper into these dynamics of stellar spin with Kepler. Given its field of view on the sky, Kepler observed approximately 1,000 stellar members of the Pleiades over the course of 72 days. The telescope measured the rotation rates of more than 750 stars in the Pleiades, including about 500 of the lowest-mass, tiniest, and dimmest cluster members, whose rotations could not previously be detected from ground-based instruments. Kepler measurements of starlight infer the spin rate of a star by picking up small changes in its brightness. These changes result from "starspots" which, like the more-familiar sunspots on our sun, form when magnetic field concentrations prevent the normal release of energy at a star’s surface. The affected regions become cooler than their surroundings and appear dark in comparison. As stars rotate, their starspots come in and out of Kepler’s view, offering a way to determine spin rate. Unlike the tiny, sunspot blemishes on our middle-aged sun, starspots can be gargantuan in stars as young as those in the Pleiades because stellar youth is associated with greater turbulence and magnetic activity. These starspots trigger larger brightness decreases, and make spin rate measurements easier to obtain. During its observations of the Pleiades, a clear pattern emerged in the data: More massive stars tended to rotate slowly, while less massive stars tended to rotate rapidly. The big-and-slow stars' periods ranged from one to as many as 11 Earth-days. Many low-mass stars, however, took less than a day to complete a pirouette. (For comparison, our sedate sun revolves fully just once every 26 days.) The population of slow-rotating stars includes some ranging from a bit larger, hotter and more massive than our sun, down to other stars that are somewhat smaller, cooler and less massive. On the far end, the fast-rotating, fleet-footed, lowest-mass stars possess as little as a tenth of our sun’s mass. "In the 'ballet' of the Pleiades, we see that slow rotators tend to be more massive, whereas the fastest rotators tend to be very light stars," said Rebull. The main source of these differing spin rates is the internal structure of the stars, Rebull and colleagues suggest. Larger stars have a huge core enveloped in a thin layer of stellar material undergoing a process called convection, familiar to us from the circular motion of boiling water. Small stars, on the other hand, consist almost entirely of convective, roiling regions. As stars mature, the braking mechanism from magnetic fields more easily slows the spin rate of the thin, outermost layer of big stars than the comparatively thick, turbulent bulk of small stars. Thanks to the Pleiades’ proximity, researchers think it should be possible to untangle the complex relationships between stars’ spin rates and other stellar properties. Those stellar properties, in turn, can influence the climates and habitability of a star’s hosted exoplanets. For instance, as spinning slows, so too does starspot generation, and the solar storms associated with starspots. Fewer solar storms means less intense, harmful radiation blasting into space and irradiating nearby planets and their potentially emerging biospheres. "The Pleiades star cluster provides an anchor for theoretical models of stellar rotation going both directions, younger and older," said Rebull. "We still have a lot we want to learn about how, when and why stars slow their spin rates and hang up their 'dance shoes,' so to speak." Rebull and colleagues are now analyzing K2 mission data from an older star cluster, Praesepe, popularly known as the Beehive Cluster, to further explore this phenomenon in stellar structure and evolution. "We’re really excited that K2 data of star clusters, such as the Pleiades, have provided astronomers with a bounty of new information and helped advance our knowledge of how stars rotate throughout their lives," said Steve Howell, project scientist for the K2 mission at NASA’s Ames Research Center in Moffett Field, California. The K2 mission’s approach to studying stars employs the Kepler spacecraft's ability to precisely observe miniscule changes in starlight. Kepler’s primary mission ended in 2013, but more exoplanet and astrophysics observations continue with the K2 mission, which began in 2014. Ames manages the Kepler and K2 missions for NASA's Science Mission Directorate. NASA's Jet Propulsion Laboratory in Pasadena, California, managed Kepler mission development. Ball Aerospace & Technologies Corporation operates the flight system with support from the Laboratory for Atmospheric and Space Physics at the University of Colorado at Boulder.